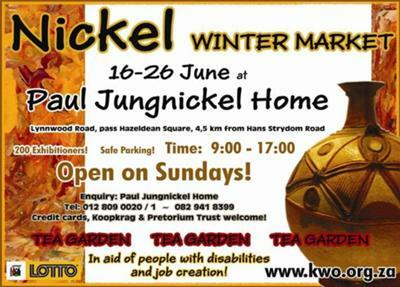 The Paul Jungnickel Home will be having their first ever winter market as from the 16 to the 26 of June 2010. The winter market is a platform for exibitors to dispaly their craftmanship and is set to create jobs. There are over 200 exibitors that will be displaying their work and this is done to support people with disabilities that live within the home. The Paul Jungnickel home is situated at plot 214 Zwavelpoort in Lynwood road. For any enquiries please call us at 012-809-0020/1 or simply visit our website at www.kwo.org.za. Come and support people with disabilities. Gates open at 9:00 am and close at 5:00 pm everyday including public holidays.Entrance is free at the market. See you at the Nickel Winter Market.